What is the focus and scope of the JOCBS? What are the articles about? We publish any article which enhances knowledge and/or understanding of any aspect of Buddhism. In alignment with our general mission, the JOCBS promotes the academic study of Buddhist texts, societies, theories and practices without taking preference of any particular Buddhist tradition over another. Also, we publish many book reviews. How can I access the JOCBS? All older volumes are freely available in the JOCBS Archive. For the most recent ones, you would have to subscribe to the journal. How often is the JOCBS published? We publish the JOCBS twice a year. Is there a print version of the JOCBS? No, we currently only offer the JOCBS online. However, you can download the PDF files and print them; we do not restrict that in any way. I often find scholarly articles difficult to read – is the JOCBS any different? The JOCBS certainly tries to be as accessible to a non-expert audience as possible, without compromising the quality of scholarship. 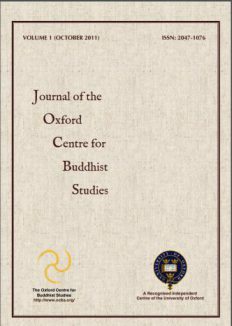 Naturally, authors may assume some knowledge of Buddhism in their readership, but we shall give preference to articles which are accessible to non-specialists, and we may sub-edit articles to improve accessibility. This means that all but the commonest Buddhist terms are provided with an English translation, and so are all quotations from Buddhist texts. For more information, please go to our Subscriptions page. I have read a great book about Buddhism, could I write a review for the JOCBS? We strongly encourage anyone who reads a book on Buddhism to which they feel attention should be drawn for any reason, positive or negative, to send us a review. The JOCBS publishes such reviews under the author’s name without subjecting them to peer review like an article (see below). The journal also makes clear that the opinions expressed may not reflect those of the editors. Anyone may reply to a review. We hope thus to publish discussions, though of course we reserve the right not to publish any contribution we think may be libellous or untrue. We shall thus not be afraid of controversy, but hope to avoid bad manners or bad taste. Who can publish an article in the JOCBS? Everyone is welcome to submit an article for publication to the JOCBS. The Journal Joint Editors and the Editorial Board will review it and then forward it to peer review. So far, the JOCBS has published articles by established academics and individual scholars with no institutional affiliation, including monastics. I would like to publish an article in the JOCBS – what do I have to know? First of all, if you wish to publish in the JOCBS, please contact Prof Richard Gombrich with a proposal of your article. Please be aware that you should provide your article with the usual scholarly apparatus. Also, you should use footnotes rather than endnotes. We prefer British English to American English but will not enforce it pedantically. For your references etc. preferably use the style from the Journal of Asian Studies. However, we will not insist on complete uniformity. For more information, please refer to the Editorial Policy.